Every year our sister company, NES, support a charity in their local area to dedicate all fundraising activity to. This year is no different and their chosen charity this year is Bluebell Wood Children’s Hospice based in Sheffield, UK. Whilst NES are the hub of the fundraising, Creavey Seal support in every way that they can! 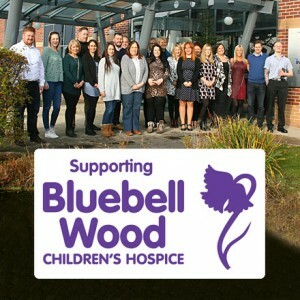 Bluebell Wood Children’s Hospice cares for children and young adults with life shortening conditions and complex medical needs. They have hospices across South Yorkshire, North Nottinghamshire, North Derbyshire and North Lincolnshire – in the UK. Looking after children and young adults up to the age of 25 years old, the charity provides incredible support services for all family members throughout the child/young adults life journey. It is safe to say that they create extremely special, long lasting memories in their hospices which are full of love and laughter. This is exactly why Bluebell Wood Children’s Hospice holds a very special place in the heart of those at NES and Creavey Seal. This year we are giving our all for Bluebell Wood! NES and Creavey Seal have charity events planned throughout the year to make sure we give everything we possibly can to this outstanding charity. From bake sales to car washing to a nominated office tea/coffee lady (or gentleman!) – we have lots of fun things planned to raise morale and, more importantly, raise as much money and awareness we can for Bluebell Wood. It’s safe to say that people are lining up to find out the dates for the charity carwash, at NES, as this is going to be performed by the NES company directors David Beare and Lee Metcalfe! We cannot wait to make the most out of this spectacle and do not worry… pictures will follow! The biggest event of the year is definitely the Three Peaks Challenge which NES’ Quality Manager, Danielle Jovanovic, and Finance Administration Supervisor, Lauren Havenhand, will be tackling! Never heard of it? The Three Peaks Challenge involves climbing the highest mountains of Scotland, England and Wales… within 24 hours. These mountains, in their usual order, are Ben Nevis, Scafell Pike and Snowdon; three gruelling mountains separated by two long drives! We do not fear though. We know that these two NES girls are made of tougher stuff! Both fitness junkies, they have partaken in a multitude of challenges. The likes of Pretty Muddy, Tough Mudder and Rough Runner (all based in the UK) are just a handful that have already been defeated. (Pretty Muddy was completed whilst Lauren was 7 months pregnant might we add!) These girls are not shy when it comes to a challenge and always want to push themselves further. We know that they will do NES, Creavey Seal and, more importantly, Bluebell Wood Children’s Hospice extremely proud! Want to support the NES/Creavey Seal girls in their next challenging adventure? Why not visit their JustGiving page at www.justgiving.com/nes3peaks – 100% of donations go to Bluebell Wood Children’s Hospice. As previously mentioned, we have lots of fun, adventurous activities and challenges happening throughout the year so please make sure you check our Latest News page every now and again to catch up on all the fundraising!